Rick and Morty Sentient Arm Funko Pop! | Nerd Much? Just pump some random genetic material into Morty's arm and chaos ensues. This Rick and Morty Sentient Arm Funko Pop! 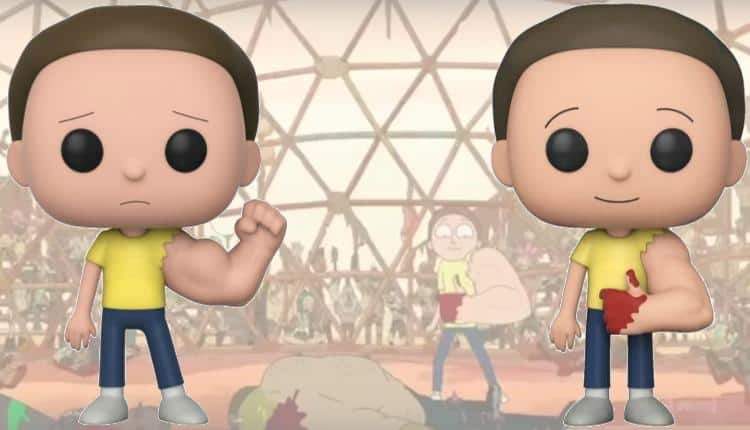 figure is of Morty, himself, from season three, episode two. In this episode, Rick transports Morty and Summer to the post apocalyptic world of Mad Max: Fury Road. What better way to deal with your parents’ divorce than living in such a cut-throat world. That is Summer’s idea of a good time, however, as she makes no secret about her ability to outright deny and ignore the situation. She turns out to be very badass and very much enjoys the new life she’s living there. Morty wants to leave, of course, as the violent nature of the Mad Max society does not suit him. Rick has a better idea, more specifically a green spherical shaped idea. So instead of asking politely, Rick decides that Morty would make a great distraction. Just pump some random genetic material into Morty’s arm and chaos ensues. Morty is horrified at the sudden presence of a sentient arm, especially when it seems happy to crush everyone who comes too close. The murder is a first too much, Morty is scared and unable to gain control of the situation. The first Pop! figure depicts this moment, the sentient arm held up in a fist of defiance. That is until he starts yelling at the arm to stop. It is at this point his true opinion of his father and his parents’ divorce come to light. Morty smiles at the camera and the sentient arm gives us a big thumbs up. Well, a rather bloody one but surely there is nothing wrong with a little violence to solve your anger issues, right? The second Pop! figure is of the moment, with the thumbs up and blood. Both are available for pre-order now and will be delivered come March 2018. Each figure it priced at $10.99 USD. If you order from the link below, please keep in mind that you cannot choose which figure you will get. There is absolutely no guarantee you will get the one you want. If you really have your heart set on one or the other, than perhaps it would be best to wait until they are released to all retailers. For more cool nerdy stuff, stay tuned to Nerdmuch.com or follow us on Instagram for a preview of new items as they arrive at our doorstep.